Pregnancy can have a big impact on your sleep and general comfort. As your bump grows, you may find it increasingly difficult to find a comfortable position to sleep or sit in. Many women swear by pregnancy pillows, using them to support their bump and parts of the body that may ache due to increased strain. If you regularly sleep on your tummy, you may find your precious sleep under threat as early as the first trimester, when sore breasts can make your go-to sleeping position too painful. During the second trimester, any back-sleepers will need to shift position, since the weight of an expanding midsection can impact circulation. By the time you hit the third trimester, even if you are sleeping on your left side (the optimal sleep position during pregnancy) you may encounter too many aches to sleep. A well-placed maternity pillow can make the difference between a restless night and some much-needed shuteye, but how do you know which type of pillow is right for you? Let’s take a closer look at pregnancy pillows, the different types, materials and uses, and what to keep in mind when buying one. Pregnancy pillows come in a range of shapes, sizes and prices, with a choice of materials. Most are easy to care for, and many can be used during feeding once baby has arrived. Depending on the type of maternity pillow you buy, it will slip beneath your tummy and between your knees, or can be wedged under your bump or back for pinpoint support, improving your posture and comfort. As with normal pillows, pregnancy-specific pillows can come with varying levels of firmness. Key features to look out for when buying a pregnancy pillow include whether it's heat regulating, hypoallergenic, whether it comes with a removable cover - and that you can buy a spare cover for between washes - and, if you plan on using it post-pregnancy, is it safe for baby? Wedge pillows, available in round or triangular wedges, can be ‘wedged’ under your bump during side-sleeping, improving alignment through the hip, legs and back, or placed under your back to support your posture when sitting. Wedge pillows are a good choice for women who find fuller pregnancy pillows too hot. They also take up less space in a shared bed, and can be used at work or when travelling. The beautiful Kit For Kids Hot Air Balloon Maternity Pillow Pack includes a wedge, while the Mothercare Wedge Pillow is a budget beauty at less than £10. This type of pregnancy pillow comes in V, U, L, C and J shapes, though the latter isn’t commonly used. V-shaped pillows aid with back pain and can stop you rolling onto your back during sleep. They also help you sleep in a slightly propped-up position – handy if you have heartburn. C-shaped pillows support your head, shoulders and legs, while U-shaped pillows provide simultaneous support to your back and stomach. Donut-shaped pregnancy pillows can be nestled between your knees to stave off hip and pelvis pain, or under your bump to support baby’s weight. They can also be positioned behind your back when sitting. The Snuggle Up collection, which comes in U, L and V shapes, is a popular ‘shaped’ maternity pillow. 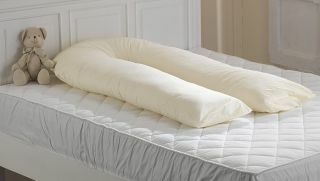 These types of pregnancy pillows are commonly designed with a longer section on one side to support your front and encourage snuggling, and a shorter section on the other side to cradle your back. Full body pillows aim to improve blood flow to baby and ease the pressure on key areas of your pregnant body: bump, hips, back and legs. They can run up to six feet long, though. A wrap or flexible maternity pillow, on the other hand, is often curved and can be further molded around your bump. These pillows are a good choice early on in pregnancy, when you want a pillow that adapts to your evolving needs. The By Carla Heat Regulating Cuddle Me Pregnancy Pillow regularly tops polls for full body support, while the Dreamgenii Pregnancy Pillow is recommended by UK midwives. Memory foam, stryofoam, polyester fiber... even wheat gets a look-in! The changes you go through during pregnancy may leave you increasingly sensitive to allergies. A hypoallergenic pillow enables you to sleep at night without triggering allergies, making it important for women with new or existing allergies or asthma – check out the Theraline Maternity and Nursing Pillow, which is a popular anti-allergy pillow. There are also organic fillings (think wool, spelt and wheat) for a natural approach, but these can sometimes have a distinct smell that some may find off-putting. In terms of fillings that mold around your body, memory foam is used by many brands. This synthetic material takes the shape of your body, but heat can quickly build up so look for a pillow with shredded memory foam filling instead. Stryofoam balls (used in bean bags) sometimes make an appearance in pregnancy pillows, but they can be noisy when moved... Unlike lightweight microbeads or polyester fiber. The only downside to polyester is that it doesn’t breathe as well as other fillings. Before you get swept away by the beautiful fabrics and tempting price tags, think about where you experience the most aching or strain when you lie down. That alone will inform what type of pregnancy pillow you should buy for sleeping. Other factors to consider are whether you need a pillow that works for sitting and sleeping, as that will rule out a full body pillow and point you towards a wedge instead. Price, portability and size are other considerations. Also, if you want a pillow that can be used during feeding or as a baby nest, study the product description to ensure the pillow poses no safety risks to baby. The Mamas & Papas Pregnancy & Nursing Pillow, for example, is versatile enough to see you through pregnancy and into early motherhood. Remember: one woman’s dream pregnancy pillow is another woman’s idea of hell, so honour your individual needs when choosing.